In the second of eight installments, ENSLAVED bassist/vocalist/lyricist Grutle Kjellson and rhythm guitarist/songwriter/lyricist Ivar Bjørnson offer song commentaries on their trademarked Norwegian strain of progressive extreme metal that will be unveiled with their twelfth studio album, RIITIIR, due out in Europe on September 28th and in North America on October 9th. 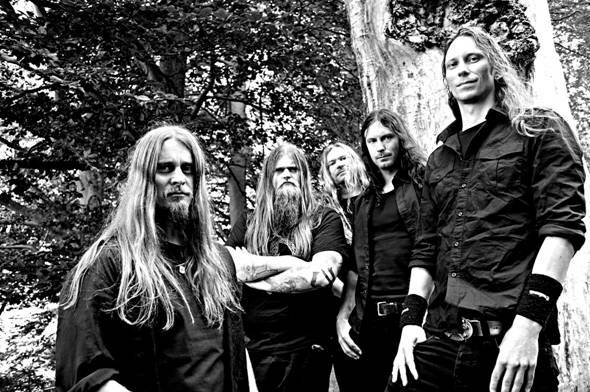 “It is impossible for a band like ENSLAVED not to be inspired by Bathory! And we somehow always end up paying a little tribute to Quorthon on each album. Bathory is our musical roots, maybe more than any other band. On Axioma Ethica Odini, the song 'Singular' became ‘the Bathory song,' and this time it was 'Death In The Eyes Of Dawn’ that got that honor! The song changed a whole lot from the first sketches, partly because of mine and Herbrand’s vocal arrangements and partly because of co-producer Iver Sandøy´s crazy idea that the second theme in the song sounded very Beatles-like and thus we had to develop that theme in a more Beatles-like direction! We did so, and ended up sounding nothing like the Beatles whatsoever! Maybe the bass guitar does, but I doubt that Macca [McCartney] ever sounded like I do vocally… not even on the demos for Magical Mystery Tour. The lyrics are inspired by the idea of self-destruction and the final judgment (Ragnarok in the Norse Mythology). You can find in several of the different mythologies around the globe: the mutual fear of the 'dark' forces in cosmos." Read their commentary on the album opener, "Thoughts Like Hammers," on the band's Facebook page. RIITIIR was recorded in Bergen, Norway at Duper Studios, Earshot Studios, Solslottet Studios, and Peersonal Sound. At Fascination Street Studios in Örebro, Sweden, Jens Bogren handled mixing duties while Tony Lindgren handled the mastering. The team of producers includes ENSLAVED’s very own Ivar Bjørnson, Grutle Kjellson & Herbrand Larsen, plus Iver Sandøy. All editions of RIITIIR are now available for pre-order from the Nuclear Blast USA Webshop. Bundles include an exclusive album artwork t-shirt + an exclusive 1-inch pin. The deluxe digi-pak edition includes a bonus DVD featuring: The Making of RIITIIR, The Band, The Studios, The Artwork. Groove/Death metal gods "Crownaside" presents "Mud To Ashes"